The waning phase of the Moon during Hindu Bhaadrapada(Telugu/Kannada lunar) month, which falls around September, is called Mahalaya Paksha or Pitru Paksha. A Paksha is of 15 days. Pitru Paksha is extremely important for Hindus, as a fortnight of revering their ancestors and clearing their Karmic debts. Hindus perform Shraddha(Tithi) during this fortnight. Pitru Paksha/Mahalaya Paksha rituals are compulsorily to be done, as per the right procedures, by every Hindu, annually. 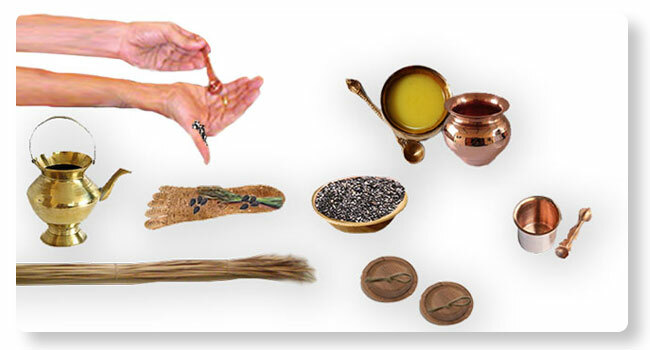 The Pitru Paksha rituals greatly relieves the Pitru Dosha(sin). Pitru Dosha causes ill health, misfortunes & lack of peace of mind. Every Hindu with deceased parent(s) must compulsorily perform the Pitru Paksha rituals. In certain cases, the actual dates of demise of their forefathers may not be known to the kartha. In such circumstances, he can offer rituals during the Pitru Paksha, thereby appeasing their souls and obtaining blessings. The Pitru Paksha/Mahalaya Paksha rituals are extremely important for the wellbeing & prosperity of our children and future generations as well. Failing to observe these rituals will lead to Pitru Dosha, thereby resulting in a cascading effect of problems for the future generations. Pureprayer introduces “Shraadh Sankalpa”, a unique subscription based service of performing ‘Pitru Karyas’ on behalf of those who are unable to perform the rituals in person. Non-Resident Indians and others who are unable to perform Shraadh rituals in person in India, could ideally engage our services to fulfil your Ancestral ‘Karmic’ debts.